All of the vests we sell feature genuine pockets. However, some of the fancy styles we sell will arrive to you with the outer pockets partially stitched shut at the factory, like men's suit coats. You can confirm the pocket by tucking your pinky down on one side or the other of the pocket, there should be a gap in the stitching that shows the pocket depth (and the lining extending into the body of the vest.) You should also be able to feel the outline of the pocket through the inner lining. While some gents prefer to leave the pockets closed to perserve the vest's trim lines, most of our customers prefer to remove the stitching and use the pockets for their watch or other necessities. Here's a quick run-down, with pictures. 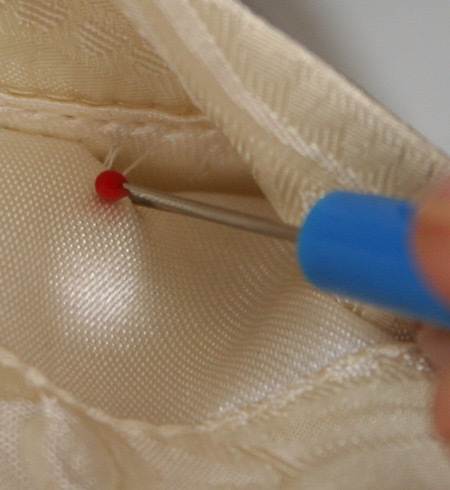 To remove the stitching, simply pull the top of the pocket apart slightly to expose the stitching. The pocket should have an opening at one end and should give a little when you pull gently on the two sides of the opening to expose the thread. 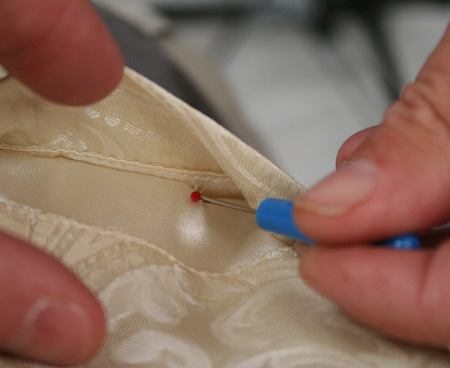 Use a seam ripper (or a small sharp penknife) and taking care to not damage the lining, pull the seam apart and cut through one stitch at a time, tugging the ends apart the to expose the next stitch. Once finished, you can gently pull out the loose threads and you're ready to go! This should be relatively straightforward, but if you have questions about it, please don't hesitate to contact us!